Peapod Doll's new doll "Christmas friend~Little Deer"
2010.12.20 Peapod Doll's new doll"Christmas friend~Little Deer" is now available! 2010.12.17 Peapod Doll's "2010 Winter Event" is now starting! Listed items in the event page are 15% off !! 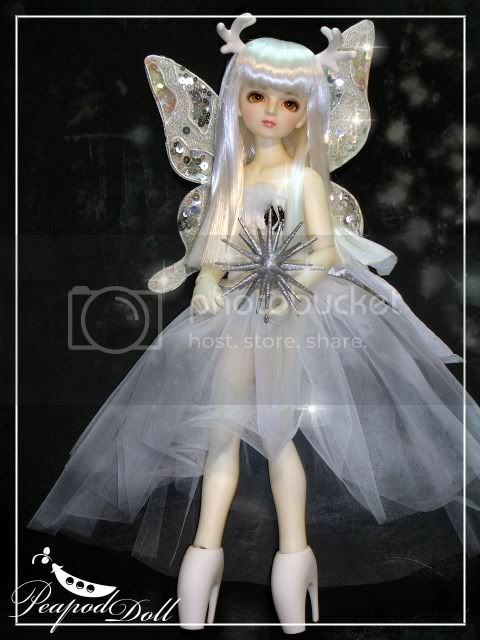 Peapod Doll's new ballet heels for 1/4 bjd are available! Please check the new items in the "Dream Land". I got some pics of the Christmas friend's reindeer parts today. Peapod Doll's first doll~ Mr. Rabbit and Rabbit parts set are available! Please check the new items in our "Dream Land". He can be changed into a boy with human parts . Of course,he will fit our hooves and mermaid tail. Our 1/6 Miss Mermaid and a secret Christmas friend are also coming soon ! He is a dream Are there body shots for him? So cute! Will the rabbit paws be sold separately? Sorry for my mistakes.....the artist told me that the Rabbit legs+ears set will be sold separately. It will be available in snow white skin (all parts). Do the parts fit Fairyland Littlefee? Will he have rabbit paws instead of hands in the future too? Hi~my friend told me that it will fit Littlefee,but the jointed part will be seen when the doll stands. How many releases are expected this December? Will you have other types of antlers in future? Like deer ones and ones for different sizes? Also, will the reindeer parts be limited just for Christmas? We will release a cute Miss mermaid and reindeer boy in December. I still don't get the information about this. The reindeer boy will not be limited. When is the Miss Mermaid doll being released? If you know, just wondering if she'll be included in the sale too. Will the reindeer parts be offered separately or does one have to buy a whole doll to get them?